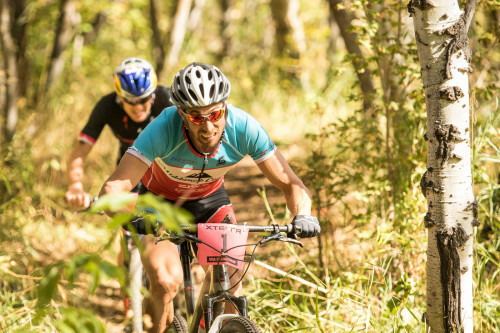 Josiah Middaugh and Braden Currie will compete in the XTERRA Ogden 2016. Photo courtesy of XTERRA. September 13, 2016 – Forty-six of the best off-roaders in the world are in Ogden, Utah for the inaugural XTERRA Pan America Championship race on Saturday. You can follow the elite race live on twitter @xterraoffroad starting at 9am MST on Sept. 17. Julie Baker, a 39-year-old out of Sonora, California, was asked how it feels to be considered one of the favorites to win the elite women’s race at Saturday’s XTERRA Pan America Championship. “Wait, I’m one of the favorites? ?” was her reply. While it may come as a surprise to Baker, it’s no surprise at all to those who follow the sport nor the women who have raced against her. Baker won the 30-34 XTERRA National Championship on this course in 2013 and last year finished fourth overall as the top age grouper. A month later she won the amateur XTERRA World Championship and this year, in her elite debut at XTERRA Beaver Creek, she won by nearly two minutes over Pan Am Pro Series leader Suzie Snyder. Her strength is in the swim. A collegiate water polo star, Baker swam more than one-minute faster than Snyder at Beaver Creek and to put that in perspective, Snyder swam four-minutes faster than the rest of the field at XTERRA Oak Mountain back in May. It’s unlikely that will happen, unless XTERRA newcomer Amanda Felder fills that role, and what that means is the first women out of the water and on to the bike will be wearing a rather plain looking blue racing kit, in stark contrast to the colorful logo-strewn jerseys of her fellow elites. “No sponsors yet, so yes, the tri suit is still blue and pristine,” she exclaimed. Attribute the lack of sponsors to her focus on another profession in the dirt, that of a soil scientist. The Stanford grad has been working on a soil survey of Sequoia and Kings Canyon National Parks for the last couple of years. “We have one more year of field work scheduled and then a lot of database and manuscript work,” explained Baker, who admits the full-time work has led to some unorthodox training methods. The rugged course here in Utah has a similar profile to that of XTERRA Beaver Creek – in terms of altitude and amount of climbing – which bodes well for Baker. “I like this course a lot and it's similar in style to Beaver Creek, so it was encouraging to have a strong bike there. I think I was so excited to be in the lead there that I kept pushing a little too much on the bike and then was more tired than I wanted to be for the run. I've done a lot more bike to run work this summer, but I think I'm still learning how to train so I hope to keep improving,” she said. Holding off the rest of the field on the bike and run will be no easy task for Baker, as several of her competitors had breakout seasons in 2016. Among them is the Kiwi Lizzie Orchard, who was fifth at XTERRA Worlds last year and won the XTERRA Asia-Pacific Championship race in Australia this year. Her strength is on the run and if she is in striking distance at the bike-to-run transition, it could spell trouble for whomever is in front of her. Then there is Snyder, just a year removed from crushing her pelvis in a pre-ride accident in Mexico, who has four Pan Am Tour wins to her credit this season. Last year’s race here in Utah was a painful one for Snyder, who was still suffering from injures at the time and in the unenviable position of having to finish the race in order to secure her No. 2 spot in the Pro Series. It's a different story for Snyder this year as she can claim the inaugural XTERRA Pan Am Pro Series title with an 11th place finish or better. Maia Ignatz had the best showing of her career earlier this season when she finished 2nd behind Snyder at XTERRA Oak Mountain. She is ranked 3rd in the Pan Am Pro Series and is the top returning pro in this year’s field. Saturday’s race is big for both her and Kara LaPoint, currently ranked fourth in the series, as those two battle for the second spot in the final standings. The payout for 2nd is $6,000, 3rd is $3,600. Ignatz is 11 points ahead of LaPoint heading into Saturday’s race. That would be a good mindset for everybody, including the other women in contention which include three-time XTERRA Brazil Champion Sabrina Gobbo from Sao Paulo, Katharine Carter from Canada, and rookie pro Liz “MacGruber” Gruber – who finished fifth overall here last year and has three age group national titles from Utah in her trophy room. For Josiah Middaugh, XTERRA has always been about the adventure. In 2016, however, the reigning World Champion may have gotten more than he bargained for. His adventures started even before his season did when he got caught in a nasty snowstorm on the drive from his home in Eagle-Vail, Colorado to the airport in Denver to catch his flight for XTERRA Costa Rica. Then on his way out of Costa Rica there was a fire on the runway, followed by a President Obama encounter upon his arrival in Argentina, and a memorable Taxi cab ride with “Kahuna Dave” to another local airport for the jump to San Juan. After the race he took time to swim with manta rays before heading to XTERRA Oak Mountain, where he once broke his knee-cap in a pre-ride, the very next weekend. In July it was back home to the calm, controlled environment of his hometown in Colorado for XTERRA Beaver Creek, unless of course your wife signs you up for a celebrity dance gala right before the race, and then you get sick. Middaugh went on to post the fastest run of the day to finish fourth. The next weekend was XTERRA Mexico where he suffered an acute case of appendicitis on the eve of the race on August 6. Organizers drove him two hours from the remote mountain countryside of Tapalpa to the specialist in Guadalajara where he had emergency surgery to remove it. Through it all Middaugh has kept his incredible sense of humor and big smile, even won a couple races to put him atop the Pan Am Pro Series standings. And while it was not quite the ideal build-up to the XTERRA Pan America Championship, Middaugh says he’s feeling good. Branden Rakita, who is 5th in the Pan Am Pro Series and a student-of-the-game, is quick to agree with Middaugh’s assessment of how the race might play out. For Shaw, who is coming over from Europe, this race is a building block to Maui. And for Sam Long, the 20-year-old who finished 2nd in his XTERRA debut at Beaver Creek in July, it’s all about the experience. In addition to the race itself, there is also a battle for the top spots in the Pan Am Pro Series that dishes out $60,000 to the top 10 men and women in the final standings. This is the last of 10 events, and with 342 points Middaugh is the Pan Am Pro Series leader. Karsten Madsen from Canada and Rom Akerson from Costa Rica are close behind with 322 points apiece. Middaugh needs to finish top 3 to secure the crown, however, if (hypothetically speaking) Karsten or Rom win in Utah and Josiah finishes fourth or worse, they could take the title. “My number one goal is to win the race and the only time I will think about the tour title is if something goes wrong like a flat tire, then I might be forced to do some math,” said Middaugh. For Akerson and Madsen, a win coupled with a fourth-place finish or worse for Middaugh would give either of them the Pan Am Pro Series title (one of a million potential scenarios) and the second-spot will likely come down to who finishes higher between the two of them. The battle for fourth is equally close with the Kiwi, Kieran McPherson, currently in fourth place, seven points ahead of Rakita. Follow it as it unfolds on twitter @xterraoffroad starting at 9am MST. The 2016 XTERRA Pan America Championship weekend is presented by Paul Mitchell, the Utah Sports Commission, and XTERRA TV at Amazon Video. Sponsors include the GOAL Foundation, Snowbasin Resort, Hub 801, Utah Media Group, Outrigger Resorts, Gatorade, PowerBar, XTERRA Travel, U.S. Forest Service, XTERRA Wetsuits, Muscle Milk, XTERRA Fitness, Compex, Optic Nerve Sunglasses, Greenlayer, and XTERRA Boards. Patrick Smyth and Liz Stephen are returning to Snowbasin Resort near Ogden, Utah to defend their Paul Mitchell XTERRA National Championship half-marathon crowns this Sunday. “I’m coming back because I want to win, and the course is a great mix of brutal climbs and fun, flowy downhills,” said Smyth, who finished 8th at the Olympic Marathon Trials in February. There are also 48 regional champions from across the country headed to Utah next week for a shot at the Paul Mitchell XTERRA Trail Running National Championship. One of the perks for winning your division in your region during the regular season is a comp entry into Nationals, and it has proven successful in getting some of the best runners from each region together for a bona-fide championship race in Utah. As proof, consider this, the men’s 40-44 division regional champions from the Florida Series, Alabama Series, Texas Series, Colorado Series, and Northeast Series will all be on the start line next Sunday. With snowfall still a month or so away (we hope), the changing colors of the fall season and the majestic Wasatch Range surrounding Snowbasin Resort provide the perfect backdrop for the Paul Mitchell XTERRA Trail Running Series season finale. The elevation and terrain of the Wasatch Mountains make the course breathtaking in more ways than one. Runners can expect to face more than 2,200 feet of total climbing over the 21-kilometer championship course, and the peak of the trail will reach an elevation of approximately 7,300 feet. The hard work to get to the top is worth it! Two-time women’s winner Liz Stephen, an Olympic cross country skier who says she’s really “a runner at heart” was blown away by the course last year.